A-HOTEL.com - Luxury and cheap accommodation in Staromusyatovo, Russia. Prices and hotel, apartment booking in Staromusyatovo and surrounding. Situated in Nugush, Baza otdykha Lesnaya Skazka features free WiFi. Among the various facilities of this property are a private beach area and a bar. Липовый сад is situated in Voskresenskoye. Free WiFi is offered. Situated in Yakty-Kul, 3.5 km from Metallurg-Magnitogorsk skiing centre, Квартира студия на Банном offers a living room with a flat-screen TV. Offering free WiFi and mountain views, бунгало на Банном в Межгорье is an accommodation set in Magnitogorsk. 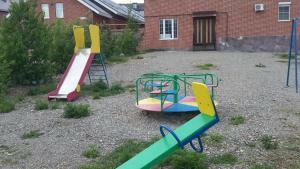 The property is 200 metres from Metallurg-Magnitogorsk Ski Lift. Featuring free WiFi, Studio Apartment Altynay is situated in Zelenaya Polyana, 27 km from Abzakovo. Magnitogorsk is 31 km away. Country House on Kurortnaya, a property with barbecue facilities, is located in Magnitogorsk, 1.4 km from Metallurg-Magnitogorsk Ski Lift. Country House Mezhgorie offers accommodation in Zelenaya Polyana. The unit is 1,5 ль from Metallurg Magnitogorsk Ski Centre and 27 km from Abzakovo. Set on the beachfront in Yakty-Kul, Бунгало на Банном has a ski pass sales point and is close to Metallurg-Magnitogorsk skiing centre. Guests staying at this country house have access to free WiFi. Bungalo Gornaya Izba is a semi-detached holiday home with a terrace, set in Zelenaya Polyana in the Bashkortostan Region, close to Bannoe ski resort. The property is 27 km from Abzakovo and boasts views of the mountains. Bungalow on Bannoye Lake is situated in Zelenaya Polyana and offers ski-to-door access. Guests have access to free WiFi. Located in Yakty-Kul in the Bashkortostan region, Apartment Shato has a terrace. This apartment provides barbecue facilities. Set in Yakty-Kul, 1.3 km from Metallurg-Magnitogorsk skiing centre, AlpenHof features barbecue facilities and a garden, as well as free WiFi. Бунгало на Банном offers accommodation in Yadgarskiy, 27 km from Abzakovo. The property boasts views of the mountain and is 31 km from Magnitogorsk. Situated in Zelenaya Polyana in the Bashkortostan region, Apartment GLTS Bannoye Lake has a terrace and mountain views. This apartment provides barbecue facilities. Уютное бунгало на Банном в тсж "Шишма"
Barbecue facilities and a terrace, as well as a shared lounge are provided on-site at Уютное бунгало на Банном в тсж "Шишма", which is situated in Yakty-Kul, just 1.1 km away from Metallurg-Magnitogorsk skiing centre. Set in Zelenaya Polyana in the Bashkortostan region, Apartment on Kurortnaya features a balcony. The apartment is in an area where guests can engage in activities such as skiing, fishing and hiking. Apartment in Belie Rosy is located in Yakty-Kul, 1.4 km from Metallurg-Magnitogorsk skiing centre, in an area where skiing can be enjoyed. Apreski Bungalo na Bannom is located on Bannoe Ski Resort, just 150 metres from the bank of the Bannoe Lake. It offers free Wi-Fi and a private parking. Studio on Kurortnaya 85/3 is a property located in Yakty-Kul near Metallurg-Magnitogorsk skiing centre. Complimentary WiFi is provided. Set in the natural Bashkortostan region, Hotel Mayak features rooms and cottages just 2 km from Metallurg-Magnitogorsk ski resort. It features a restaurant offering panoramic views of the surrounding mountains.